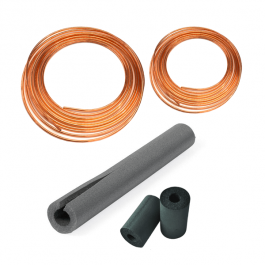 The CT38X Copper Line Set Tubing is strong and corrosion-resistant which makes it the leading choice of modern contractors for plumbing, heating and cooling installations in all kinds of residential and commercial buildings. The combination of easy handling, forming and joining permits savings in installation time, material and overall costs. Long-term performance and reliability mean fewer call backs, and that makes copper the ideal cost-effective tubing material. The Insulation is used to retard heat gain and control condensation drip from cold-water plumbing, chilled-water, and refrigeration lines. It also efficiently reduces heat flow for hot-water plumbing, liquid-heating and dual-temperature piping.